The Cotswolds offer a wide variety of racehorse training facilities all invariably superbly located in villages and market towns or the beautiful surrounding countryside. Our list includes racehorse trainers offering their own individual style of training. Situated in the Vale of Evesham, surrounded by beautiful countryside, sits Tony Carroll's Training yard. Designed and purpose built for the care and training of Racehorses. Tony and the team moved into their new home in early 2006 making it one of the most modern Racehorse training establishments in the country. Situated in the Vale of Evesham, surrounded by beautiful countryside, sits Tony Carroll's Training yard. Designed and purpose built for the care and training of Racehorses. Tony and the team moved into their new home in early 2006 making it one of the most modern Racehorse training establishments in the country. Welcome to Kahlil Burke Racing, where the main yard of 30 boxes is set in the heart of the Cotswolds and only 15 miles from the home of national hunt racing, Cheltenham Racecourse. Kahlil Burke Racing prides itself on high standards ensuring that every owner and horse are made to feel special in receiving only the very best of care. Trainer based at Tyre Hill stables,Tyre Hill Stables is located on the edge of the pretty village of Hanley Swan which nestles under the Malvern Hills. He focuses on training point to pointers and hunter chasers. It is a very tranqil setting for the horses, whilst at the same time being conveniently close to the M5 and M50. Situated in the beautiful Worcestershire village of Abberley (the heart of the Midlands, and the Abberley and Malvern hills geo-park) and near to Worcester racecourse, is a purpose-built racehorse yard, with excellent facilities. It boasts 40 stables, and equine pool, solarium, horse walker, treadmill, all weather gallop, and a new all-weather sand circular gallop. With the additional 300 acres of privately owned rides, long grass gallops and quiet country lanes it is hard to find a more ideal and professional training site. National hunt trainer at Adlestrop stables in the Cotswolds. Adlestrop Stables combines beautiful and traditional Cotswold life with some of the country’s most modern training facilities. The stables were originally a stud farm run by John and Cynthia Hayden where they stood the successful National Hunt stallion Idiot’s Delight and competed at top level in the world of carriage driving. Champion three-day-event rider Mark Todd then occupied the yard and used it as a base to win some of the world’s major three-day-event titles. In 2002 Richard went about developing the yard into one of the most up-to-date training complexes in the country. At Jackdaws Castle we are privileged to offer the finest facilities of any National Hunt yard in the world. Jackdaws Castle is set in 500 acres of countryside in the Cotswold's and we have over three miles of horse walks within the estate. We have at our disposal three eight-furlong grass gallops, each with an incline climb. There is an excellent five-furlong Eurotrak gallop, and a Polytrack gallop over a mile long. Jackdaws Castle has designated all-weather gallops comprising five schooling flights of hurdles alongside a further schooling strip of five fences which can be used in the extremes of different weather. Aside from two all weather gallops, the facilities at Naunton are continuously being added to. The benefits of two horse walkers and an equine pool are frequently displayed with horses returning from injury or starting off on the road to fitness, while the likes of Ollie Magern virtually live in the pool! We have five flights of hurdles and schooling fences on our uphill grass gallops and the outdoor school is used for grid work and practice over "baby" obstacles before horses graduate to schooling on the gallops. The six and a half furlong all weather wood chip gallop is used for faster work. The one and a half furlong Wexford Sand cantering circle is used at the beginning of the horses training programme to teach them to settle and relax into steady catering. 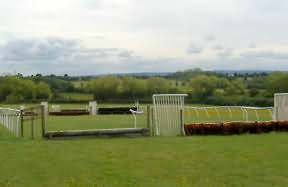 The Fibresand gallop is three and a half furlongs in length. The majority of the horses in training are turned out in the paddocks on a daily basis. This keeps the horses happy and relaxed. We have separate fields which are used for summering and resting horses out of training. David has been training for about 7 years.2 Years ago he moved to his present base, Wyck Hill Farm, Stow on the Wold, where he and his wife Lucy are working hard to establish their state of the art training yard.They have 35 boxes at present and their own allweather gallops along with fenced paddocks and fields in which the horses can relax. The establishment has that relaxed informal atmosphere that takes a lot of work to establish. I run my 46-box yard in the heart of the beautiful Forest Of Dean, just 20 minutes from the Severn Bridge. I have been at Tudor Racing Stables since 1996, training numerous winners both over the sticks and on the flat. Woodchip and Sand Gallops – The yard has two gallops, a 7-furlong woodchip gallop which has a very gradual climb. This was completely re-laid in 2004.The sand gallop is 4 furlongs and is gradual for the first furlong, then steepens sharply for the rest of the way. There are 36 spacious and well ventilated stables constructed in a converted barn which, along with tack rooms and feed room, make the perfect relaxed environment for the horses and a secure and easily manageable working surroundings for the staff. The most important feature of any training yard is the gallop and our new four furlong all weather gallop is as good as it gets. Constructed by David Humbert of Dri-Ex, the surface is the latest wax coated Eurotrack, made by Parkway. The gallop has a steady incline rising a total of 300 feet from bottom to top providing a genuine test of stamina for the horses. Hull Farm, Chipping Norton, Oxfordshire. Charlie belongs to the elite group of new generation trainers emerging from the racing industry. Leading a young ambitious team the fledgling yard has been blessed with great success. Not only are we lucky enough to have great horses, we are also blessed with fantastic owners who enjoy being part of our team. Cotswold Stud is the perfect environment for a racehorse to reach its maximum potential. Set in the glorious rolling hills of the Cotswolds it is within easy reach of all major routes.